I thought that it might be interesting to make up (lol) a tag about what I like and dislike in certain makeup items. I don't know if this is already a tag or a thing so I do apologise if it's been done before. Basically I'm going to talk about favourite products of each category, the shades I tend to choose and what I personally look for when I buy items. This also might help people who are reading my reviews so they have notes in mind about what I personally look for in products as we all like different things in different items. The catergorys I've chosen to write about are Eyeshadow, Lipstick, Blush, Foundation, Mascara and Eyeliner. Bare in mind these are all my personal preferences when it comes to makeup by no means is it right or wrong things to look for in products. I think that's pretty logical, but I do just want to put that out there as I find it increasingly strange how some people take bloggers or "gurus" words as gospel when at the end of the day we all have different skin types, preferences and likes and dislikes when it comes to the beauty world! Do let me know of you do this tag as I'd love to see what other people look for when buying their makeup! I tend to use more cream shadows than powder ones. While I do like powder shadows, I tend to buy them in palettes over single shadows as they are normally cheaper, transportable and easier to keep track of. I always wear neutral eyeshadow shades in either shimmer or frost finishes. I like pink tones (MAC Gleam, Chanel Emmerveille or Rituals cheek and eye palette in Peach), browns (MAC Woodwinked or Pop Beauty Lid Bronzer) or golds (MAC Honey Lust, MAC Amberlights or the MUA Heaven and Earth Palette). I don't like to spend age on doing my eyeshadow so I tend to use a light shade on the lid and then wear a darker toned one to line my lower lashes. I wear the same two blushes almost everyday, either theBALM Frat Boy or Look Beauty Blush in Flirt. I always wear shimmer finish blushes or a gold highlighter (Nars Albatross) to make it even more glowy. I like my blushes to be soft and finely milled with small particles of shimmer but nothing gritty or too noticeably glittery. I tend to stick to warm pinks, orangey corals or pinky peaches to warm up my face and compliment my skin tone. I always choose matte or semi matte lipsticks. I can't emphasise how much I hate shimmery, frosty or sheer lipsticks! I tend to stick to coral, peachy pinks or anything light to mid tone pink. I generally prefer yellow based lipsticks as it suits my skin tone but so occasionally break that rule. My favourite lipstick formulas are MAC Matte's and Revlon Matte Lipsticks. I never wear or buy lip glosses, but I do like lip balms especially the Korres Lip Butters and Carmex. I used to wear full coverage matte foundations (Estee Lauder Double Wear or Double Wear Max) but recently moved onto medium coverage glowy foundations. I really like Estee Lauder Invisible Fluid Makeup, MAC Face and Body and Makeup Forever HD foundation. 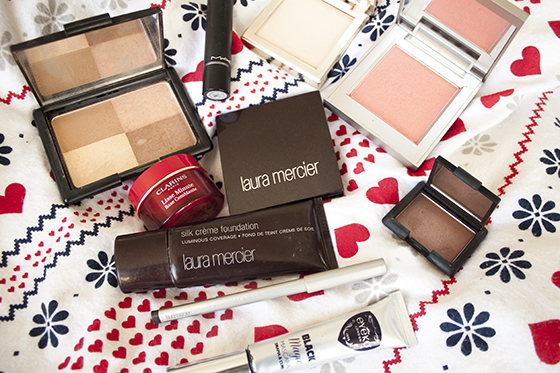 My favourite at the moment is Laura Mercier Silk Creme. I have a warm skin tone but very pale natural skin tone so find it hard to find the right colour to suit me as I do fake tan a considerable ammount! I have a lot of scarring on my chin and pigmented cheeks so as long as a foundation covers that I'm normally happy! I like long wearing foundations, that don't oxidise or look cakey after long wear. I don't mind splashing out on foundation as I do think its important to have a good base! As I have sensitive eyes I find it so hard to try new mascara so I tend to stick to the same brands. I have to admit I haven't got a favourite one but I currently like Avon Supershock and Dior New Show. I tend to pick volumising mascara, the blacker the better and I like to layer up my mascara a lot… possibly to the point of spider lashes! I wear black flicked liner every single day and I have done for years now. It's more habit than anything, although in the last month or two I have stopped wearing it so religiously! Sometimes I don't think I look like myself when I don't wear it. I normally wear Loreal Superliner Carbon Gloss or Fashionista Gel Eyeliner or the Pixi Lash Line Ink. Qualities I look for in eyeliner are really opaque dark black eyeliner that doesn't fade or go grey throughout the day, water resistant, smudge proof, quick drying and non-irritable on my sensitive eyes.